Now that Mitt Romney is the presumptive Republican nominee, attention has turned to his impending selection of a vice presidential choice. There has already been so much VeepWatch coverage one might think the deadline for Romney’s pick is measured in days or even hours. We here at the Crystal Ball are as guilty as anyone else: We have explored the VP “Swing State Selection Myth” and have ranked the notable contenders for Romney’s number two slot. However, it’s almost certain that the selection is months — not weeks — away. In the modern era of presidential politics, the VP nominee is typically determined only days prior to the party convention. As shown in Chart 1, the decision has recently been made only about two to six days beforehand. Since 1992 — if one discounts the 2004 outlier, when John Kerry selected John Edwards 20 days before the start of the Democratic convention — candidates have chosen their running mates, on average, just four days before their party’s convention. Prior to 1992, VP choices were sometimes still selected at the actual convention. Sources: Dates for effective end of races are from CQ Weekly; selection dates are from archived New York Times articles; and convention dates are from CQ Press Guide to US Elections, 6th edition, Volume I. The Republican National Convention begins on Aug. 27 this year, nearly four months from now. If Romney follows the recent path for choosing his VP nominee, we will be biting our fingernails in anticipation until at least Aug. 21, something no one’s cuticles can stand. Even if he decides to choose someone earlier, Romney may elect to mimic Kerry and select his running mate just a few weeks prior to the convention. Why do presidential candidates wait so long to decide on a running mate? An old rule of politics is to never make a decision before you have to. While we know the date of the election, it is impossible to know what will happen between now and Nov. 6, or even before the opening of the GOP convention in late August. Perhaps there will be some unanticipated event, such as a conflict with Iran. In that case, if Romney decides his VP choice too early and selects someone with good economic credentials but little foreign policy experience, it could negatively impact his chances. While key events could take place after the convention, waiting until the last possible moment gives Romney the most time to weigh the important factors in the election. Additionally, waiting gives a candidate the maximum time to fully vet the short list, reducing the chances for Palin-esque trouble. But there are other reasons why nominees delay. Doing so builds drama as the convention approaches. 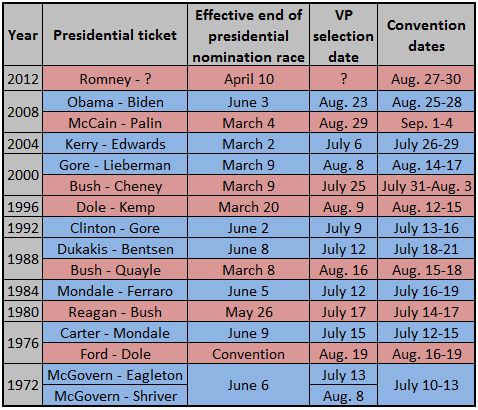 In this age of early finishes to nominating contests, the VP selection is really the only new and exciting campaign element before a cut-and-dried convention. Moreover, putting off the choice minimizes expenses for the campaign. Once a candidate has chosen a running mate, that person and his or her family become a major part of the operation. The VP nominee will be flying around the country separately to raise money and talk to voters, creating the need for more staffers, planes and logistics. Procrastination also reduces the available time for intra-party opposition to build toward the VP nominee-designate — something that could potentially embarrass the ticket at the convention. Yet there are factors that could lead Romney to break the mold. As the general election starts, President Obama and Vice President Biden are already tag-teaming him. Therefore, it might benefit Romney to even up the fight quickly with a VP of his own. History also tells us that naming an early choice could help if the selection were to flop by giving Romney time for a Plan B. George McGovern picked Thomas Eagleton at the 1972 Democratic convention, but when reports surfaced after the convention that Eagleton had undergone electro-shock therapy years earlier, McGovern dumped the Missouri senator. More than three weeks passed before the DNC ratified the selection of a replacement, Kennedy brother-in-law Sargent Shriver, and the mess irreparably harmed McGovern’s already dim chances in November. Romney could choose someone and still replace that individual before the convention. It would look terrible at the time, but potentially the Republican ticket would have the extra weeks needed to recover, given the lightning-fast change of topics in our wired world. Lastly, Romney will want the convention to focus on him, not a very new VP. At the moment, he has a large “likability” gap to close, and the convention is his big chance to reintroduce himself to voters and warm up his image. These arguments aside, Romney’s professional training and personal characteristics may take precedence in his vice presidential timing. He is the ultimate manager and consummate planner, someone who wants to demonstrate a business-like approach to this most important selection. A lengthy, thorough process is Romney’s probable path to picking a running mate. If that process ends earlier than expected, a surprise announcement in July or early August is a possibility. The best bet, though, is that Romney, a traditionalist in most parts of his life, will follow the typical pre-convention timetable come August.